I just went to send a link to a client to this resource and discovered it wasn't here!?! 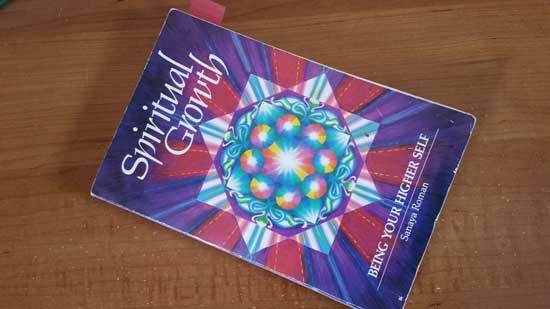 This book was very helpful for me when I was on focused path of reading external material to connect internally. Sounds like a loop, but I think we do this. We reach outside ourselves ... perhaps we have to ... until we find that connection within. Read, explore, connect. As was true for me, at some point you will trust the Truths that spring forth from within the Self ... Truths already there awaiting your return. "You will be amazed at the power of one person focused on his own growth to transform the people he spends time with. One man went to work in an office where everyone, stressed and hurried, ate candy and unhealthy snacks all day. At first he found himself criticizing them, then he began eating the same kinds of food himself. One day, unhappy over his increasing lack of energy and rapid weight gain, he decided to start eating healthy food and brought interesting, healthy snack with him every day. Soon, others were asking him about what he was eating. Over a period of several months many people in the office started eating healthier snacks. He never preached, criticized, or tried to get them to change. He taught them by example. "There is no one 'right' way to grow. There are many paths to enlightenment and God. See what is beautiful in every person's path, in every religion, and in every belief system. Honor other people's paths even if they are different from yours. Be inclusive and loving, and look beyond the form of people's beliefs to the essence. There is no one right way; there is only the way that is right for you. There is something unique, perfect, and beautiful in every culture, in every system of belief. Look for what you have in common with others and accept and love those who are on different paths." Amen! Thank you Orin via Sanaya Roman for helping me and "others" within the One on this journey!